In the mean time, I’ve also been writing up a menu for the next few days, that involves using up some vegetables I have in my pantry and freezer. 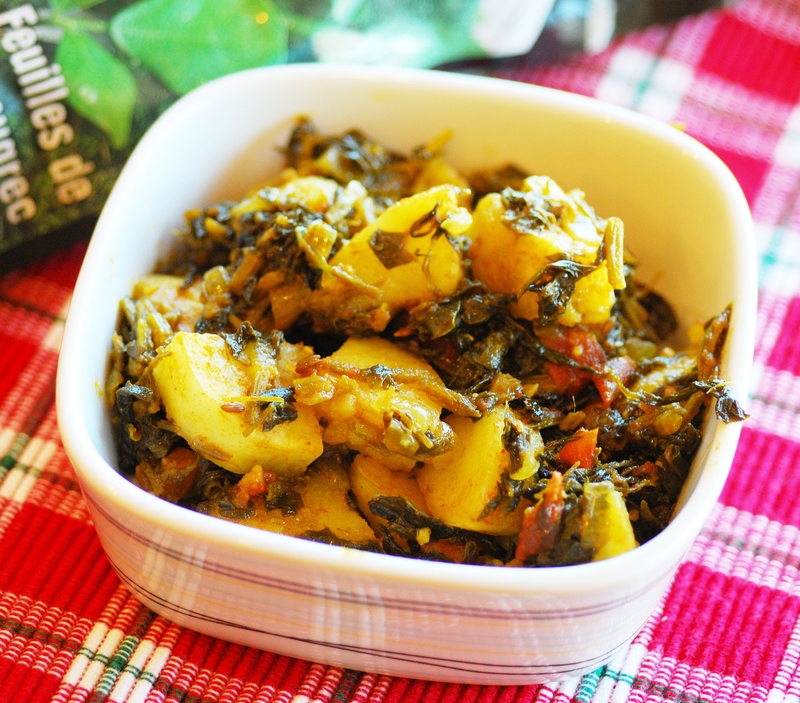 In today’s post, I’ll share the recipe for one such menu item with you – Methi Aloo sabzi. In line with my newly found aversion to lengthy recipes, this nutritious vegetable dish takes less than 1/2 hour to prepare. A sabzi, in Indian cooking is the name for any vegetable preparation, usually eaten with Roti (Indian flatbread) followed by any lentil preparation and rice, making it a complete vegetarian meal. 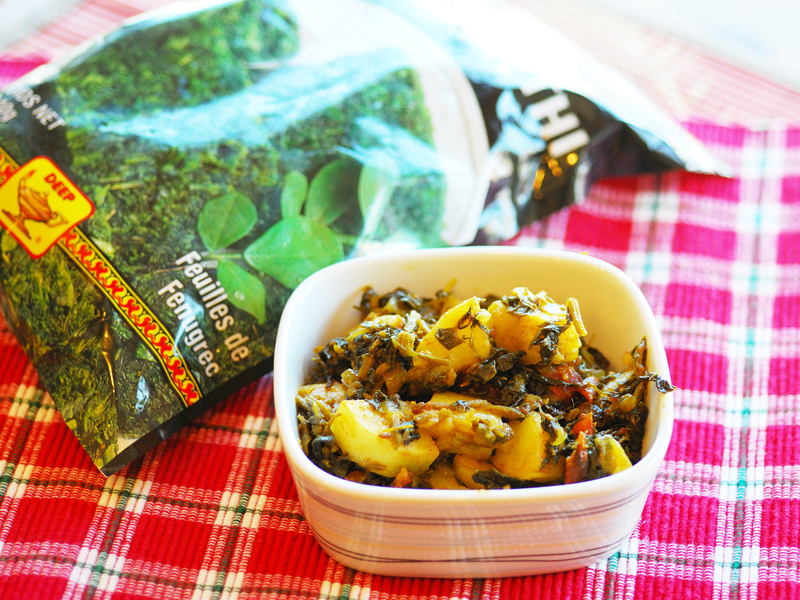 Methi is the Hindi word for Fenugreek, which is consumed in Indian cooking in the seed form and the leaf form. Apart from the simple, earthy flavors of this vegetable dish, the Fenugreek plant has many health benefits. It helps lower blood cholesterol and blood sugar, when eaten on a regular basis. 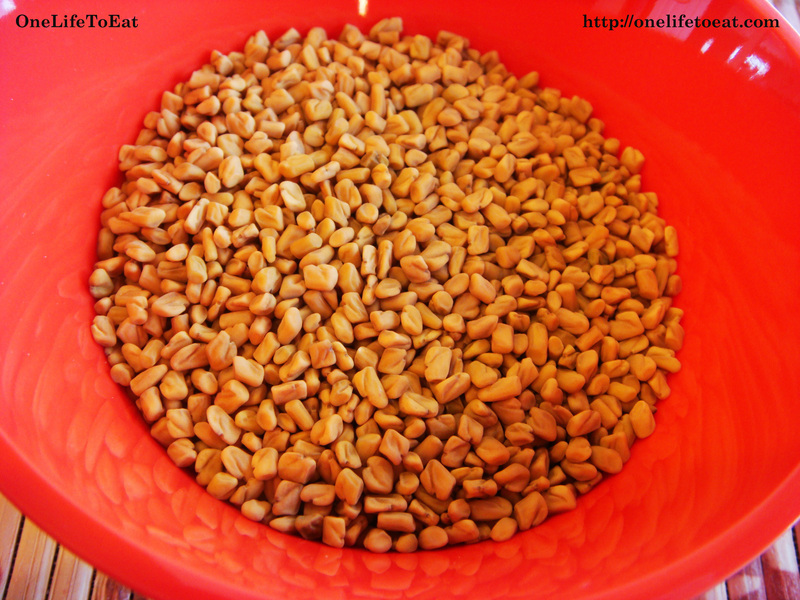 Both the leaves and seeds are high in calcium and hence a wonderful food to eat throughout your life. This is real, simple, everyday Indian cooking for you. The leaves of the methi plant are a little cumbersome to clean, so I use frozen fenugreek leaves, which considerably cuts back cooking time. Follow this same recipe with any other green available at your local market. I once tried it with Swiss chard from the Farmer’s Market here in Minneapolis, and it tasted brilliant! Here’s how I make this simple, nutritious, delicious dish. Garnish with fresh lemon juice and serve hot with Roti. The flavor of methi leaves is mildly bitter. You may add more lemon juice and sugar to the dish to mask the bitter flavor. To make this dish more spicy, add chopped green chilies. I am a fan of potatoes in absolutely any form and this dish is no exception! My mom makes something similar to this and I love it so thank you for giving me the recipe so I can make an attempt myself! By the way I will be in Minnesota for a wedding at the end of January. I’ll only be there for 2 days though so I don’t know how likely a meetup would be? Yeah, potatoes absorb almost any flavor so well no? I don’t get fresh methi here all the time either.. the taste is different from the frozen blocks that I use instead. Although, cleaning fresh methi is quite a pain. So much mud to wash off! Almost like leeks. This looks so comforting and hearty – perfect winter food! I haven’t ever cooked with fenugreek leaves or methi – I’m going to have to try some next time I go to the Indian market…which I sorely need to do. I’m out of chana dal and a bunch of spices…and I need to get back to cooking some Indian food soon! You love chana dal don’t you? You must also give Toovar dal aka yellow dal a try. Takes much lesser time to cook and perfect for soups as it disintegrates into a thick creamy consistency. Wow….I have been looking all over the place for ethnic food recipes! I have always wanted to try Indian cuisine myself. This looks especially delicious. It was so nice to meet you at school this week. Did you know that some of the Hmong farmers around the Twin Cities grow fresh fenugreek (for marketing to Indians living in the area)? I’ve seen it for sale at the Minneapolis Farmer’s Market (more often on the weekends at “Lyndale” than at the Thursday market on Nicollet Mall, but sometimes there, too). I’m so happy you told us about your blog–thanks! Love these potatoes. Here is my twist on them. Prepare the gnocchi according to the package. In a frying pan, heat the oil and add cumin seeds. When the cumin seeds begin to crackle, add onions and garlic. Cook the onion on medium heat until they are soft and translucent. Add all the dry ingredients to the onion/garlic mix. Mix the cooked gnocchi and the onion/garlic mix together. Sprinkle with salt and lemon juice. Add a little cilantro OR Chutney Coriander Sauce to the top and voila!